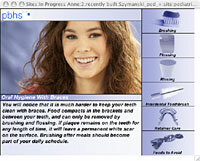 Keep your braces and teeth extra clean during your orthodontic treatment. Pay special attention to the area between the braces and your gums. Our dental hygienists and certified dental assistants will be able to help you master the proper technique. Brushing and flossing after meals should become part of your daily routine. Use a soft toothbrush with firm pressure and brush at a 45-degree angle to the tooth and gum; brush in small circles above and below the brackets. Click here for visual instructions. Your toothbrush will wear out faster because of your appliances, so be sure to replace it whenever the bristles start to fray. A Waterpik can be a useful addition but it cannot remove the sticky plaque that adheres to the teeth. Rotadent toothbrushes are very helpful in keeping gums and teeth healthy. Please do not eat hard foods: nuts, ice, crisp taco shells, whole apples and carrots (cut them into pieces first), hard French bread crust and rolls, spareribs, corn on the cob (cut the corn off the cob before eating), and popcorn! These foods risk breaking brackets and wires. Also, beware of nail biting and pen or pencil chewing habits, since these can damage your braces. Do not eat sticky foods: taffy, caramels, bubble gum, or sticky candy of any sort. Use common sense about most foods.